We seek to provide the best possible service to its customers by providing the best possible range of products and services. 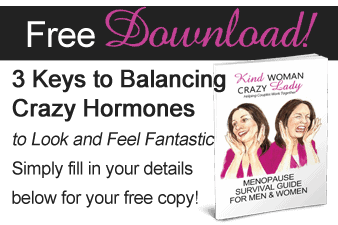 Who is Men Surviving Menopause? Primarily it is the shared experience and life together of Peter and Linda Butler. When we refer to personal information we mean information from which your identity is apparent. This information may include information or an opinion about you, from which your identity can reasonably be ascertained. Why we collect your personal information. We collect and receive personal information from our customers in order to conduct our business, keeping the client informed of new articles, videos, pod-casts and products. Where reasonable and practical we will collect your personal information only directly from you. At face to face consultation, via email, via phone conversation or via mail.To whom will we disclose your personal information? (b) you have consented to us doing so. Sometimes we are required or authorised by law to disclose your personal information. Circumstances in which we may disclose your personal information would be to a Court or Tribunal in response to a request or in response to a subpoena or to the Australian Taxation Office. There is no charge for removing your name and address from our data base. It is important to our relationship that the personal information we hold about you is accurate and up to date. During the course of our relationship with you we will ask you to inform us if any of your personal information has changed. If you wish to make any changes to your personal information, you may contact us. We will generally rely on you to assist us in informing us if the information we hold about you is inaccurate or incomplete. We will provide you with access to your personal information we hold about you. You may request access to any of the personal information we hold about you at any time. To access personal information that we hold about you use the contact details specified above. We may charge a fee for our costs in retrieving and supplying the information to you. Denied access to personal information. There may be situations where we are not required to provide you with access to your personal information. For example, such a situation would be information relating to an existing or anticipated legal proceeding with you, or if your request is vexatious. An explanation will be provided to you, if we deny you access to your personal information we hold. In most circumstances it will be necessary for us to identify you in order to successfully do business with you, however, where, it is lawful and practicable to do so, we will offer you the opportunity of doing business with us, without providing us with personal information. Such a situation would be where you make general inquiries about . Where sensitive information is collected, stored, used or transferred about you, we will only use this information if you have consented or in the exercise or defence of a legal claim. Sensitive information is information relating to your racial or ethnic origin, political persuasion, memberships in trade or professional association or trade unions, sexual preferences, criminal record, or health. How safe and secure is your personal information that we hold? We will take reasonable steps to protect your personal information by storing it in a secure environment, and when the information is no longer needed for any purpose for which the information may be used or disclosed, it will be destroyed or permanently de-identified. We will also take reasonable steps to protect any personal information from misuse, loss and unauthorised access, modification or disclosure.